Haven’t decided on a hotel yet? 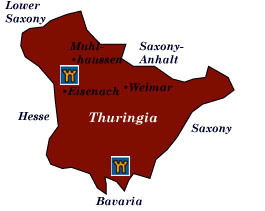 You can look at other available hotels in the Thuringia region with Booking.com. Once the center of Germany’s golden age, Thuringia is fast becoming a popular destination for those interested in culture and history. Wonderful castles, churches, palaces, and abbeys can now be explored, as well as the former haunts of Bach, Wagner, Goethe, and Schiller. And if you take a break from the historical charms of this graceful region, you’ll find rolling green hills, spruce and oak forests, enchanting villages, and inspiring walking trails. Weimar German culture soared to new heights here. Bach played organ for the court, and Goethe and Schiller pursued their literary genius. For starters, visit the Goethe National Museum, which includes the Goethehaus, where Johann Wolfgang von Goethe lived for 47 years. The Goethe Gartenhaus was his first house and later summer residence. Part of the National Museum also holds the study of poet and philosopher Friedrich Schiller. Today, these residences are listed as UNESCO World Heritage sites. The Stadtschloss is a 16th-century city castle, once the residence of the ducal family of Saxe-Weimar. If you’re interested in the Bauhaus School of 20th-century design, the movement was founded here in 1919 by Walter Gropius. The Bauhaus Museum offers a great background of its style and influence. Buchenwald The infamous concentration camp lies in brutal contrast to the cultural glories of Weimar. A memorial stands above the mass graves of some 56,500 souls, and beyond is the camp itself and a small museum. Eisenach-Wartburg Looming over the half-timbered town of Eisenach, the 11th-century Wartburg Castle was reputedly the location of the minstrel’s singing contest in Wagner’s opera, Tannhäuser. From 1521-1522, Martin Luther was shielded here while he translated the New Testament into German. Today, the castle is a UNESCO World Heritage Site. Best of all, part of the castle is now open as a castle hotel. To visit the house where Luther lived as a boy, come to Lutherhaus. Baroque composer Johann Sebastian Bach was born in Eisenach in 1685. The Bachhaus is a small museum dedicated to the entire musical Bach family with extensive exhibits of Bach memorabilia. If your taste runs more to Richard Wagner, the Reuter-Wagner Museum features an exhibition only second to that outside Bayreuth. Erfurt History places Erfurt’s founding in the middle of the 8th century. The narrow streets of the town’s medieval center are dominated by the Mariendom, the stunning 14th-century Gothic cathedral. One of Erfurt’s most interesting landmarks is the Krämerbrücke, or “merchant bridge,” which spans the River Gera. Lined by 32 houses and shops, this Renaissance bridge is Europe’s longest of this type. Gotha Once the wealthiest town in Thuringia, Gotha was the one-time home of Duke Ernst I, the founder of the House of Saxe-Coburg-Gotha—later to become the UK’s Windsors. The town’s most striking attraction is the largest surviving baroque palace in Germany, Schloss Friedenstein. Paintings from artists Rubens and van Dyck hang inside the small museum. Mühlhausen Dating from the 10th century, Mühlhausen offers picturesque architecture, cobbled streets, and some well-preserved city walls and towers. The town was the center of the 16th-century Peasants’ War, led by Thomas Müntzer. Singular among the town’s Gothic churches is the Divi-Blasii-Kirche, which was built for the Teutonic Knights in the 13th century. Here, too, is one of the historic locations where Bach played organ. Rudolstadt The princes of Schwarzburg-Rudolstadt enjoyed life here during the Age of Enlightenment. Visit the Schloss Heidecksburg for a glimpse of life inside a baroque palace and a panorama of the town and surrounding countryside outside.